Have you seen someone recently riding around town or on the trails with a bike using super wide tires? If so, then you have already witnessed a fat bike in person. When the fat bike first hit the scene, they were popping up everywhere. And you know what? They are just as popular today as they were then. People love fat bikes because they can take you just about anywhere. You can ride through the snow, down technical trails, and across beaches. You can ride along roads, up mountains, and take them backpacking through the woods. So, if you want to learn how to choose the best fat bike, or read about the top bikes of 2018, then you came to the right place. This page is your guide to find a fat bike that’s best for YOU starting with their key features. When choosing the best fat bike, it’s essential to make sure it’s the best for YOU. This way, you not only have an enjoyable experience, but you feel safe, and get your money’s worth too. So, to help you in the process, I put together a list of the most critical features when choosing a fat bike. Keep reading and learn about a fat bike’s tires, suspension, usage, drivetrain, weight, size, and price. As you might have guessed, the most essential part of a fat bike is also what stands out the most: tires. And they are not just your usual everyday mountain tires, these things are BIG. Like so big that some of them use the same tread pattern as monster trucks! 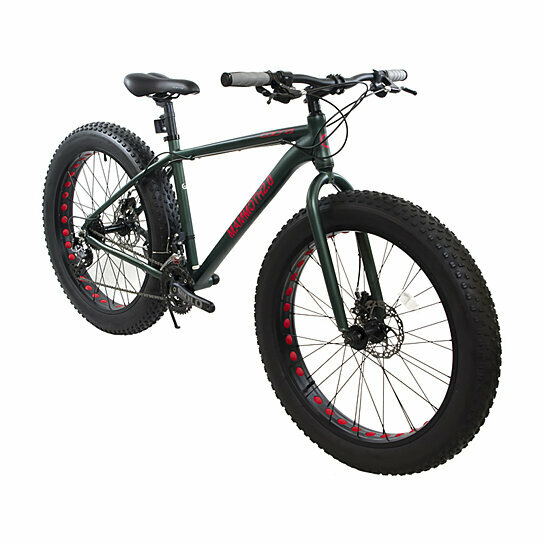 I don’t know about you, but if I were going to ride a bike through the snow, the monstrous tires on a fat bike would be my top choice. The tires range from 3.7” to 5.05”. Naturally, the wider the tire, the larger the surface area. Not only does a greater surface provide more stability, but it increases traction and suspension too. When you first start riding trails, an increase in stability and traction will make you feel like a pro! As you can image, the type of traction, stability, and suspension dished out by a fat bike is critical. It will allow you to ride through the snow or in the sand with no problem. When the trails become difficult and uncomfortable, your ride remains exciting and enjoyable. So, if tires are the most important feature, what size tires should you buy? Well, if you’re riding in sand or snow, then you want to go WIDE. So, if you live by a beach or only plan to ride in the winter then shoot for a tire in the range of 4.8”-5.05”. If you go any smaller, you still have enough tread to rip down any single-track trail with confidence, but the wider tires help in messy conditions. You also want to keep your eye on the wheel dropout spacing. The wider the spacing, the wider the tire. If you expect to ride with a set of tires 4” or over, then look for a spacing of 190mm to 197mm. No matter what size fat bike tire you choose, they will still be wider than average. You will still get an increase in stability, traction, and suspension if it’s 4 inches or 5. So pick the size best for you, and enjoy the unique feel provided by a set of FAT tires. Here’s the thing, when you ride a fat bike, the tires themselves provide suspension. Yes, the wide tires, in addition to low air pressure, means more rubber on the ground. So, when a tire is used with a rigid fork, the combination provides you with a natural suspension system. On the other hand, some riders like extra suspension. Especially when they plan to ride on more technical trails. If this is the case, you may want to use a suspension fork instead of a rigid one. When you are planning on ripping down mountains or riding on top of rocks, then choosing a fat bike with a suspension fork is critical. As the name applies, a suspension fork comes with a suspension system on the fork. This typically consists of two hydraulic shocks used to cushion your ride and absorb the overall shock. Okay, so now you know there’s both a rigid and suspension fork available, now the question becomes… what’s the best fork type for you? Well, there’s pros and cons for each, so it will depend on your personal preference. First, a suspension fork makes a world of a difference while riding on challenging trails. They make the experience more comfortable. Also, when trails get tough, they increase your control which not only makes you ride more confident, but it keeps you safer also. Now, on the other hand, a rigid fork is not only lighter, but it’s much simpler in general. And here’s the best part: a rigid fork requires basically no maintenance or repairs. That’s compared to the technical nature of a suspensions fork. When riding with a suspension fork, you’ll have a good chance of performing repairs and making adjustments from time to time. If you’re looking for a reliable and stable feel for long trail rides, then the rigid fork is the way to go. I know we’ve touched on this subject a little bit, but it’s worth its own section. So here it is—you should really think about what you want to use the bike for. This will help you determine precisely which fat bike is best for you. Do you plan on using it for winter weather training? Well, they have fat bikes geared more towards the snow. It’s a great way to train outside when the cold weather hits. In this case, a fat bike with a wider set of tires will be the best choice for you. Are you planning on riding the bike all year round on the trails? Certainly, you’ll want a fat bike that’s both reliable and durable. Planning on backpacking trips? Then a rigid fork and lightweight frame is probably the best way to go. Maybe you’re just looking for a fat bike to exercise from time to time, in this case, you may want to go with a low-cost option. Or maybe you want to enter competitions and race one day. Then you’ll want to invest in a high-quality bike sold by a well-known racing company. Bottom line is this: if you are looking for a fat bike for the snow or sand or for all-year-round riding, then the wheels, weight, and suspension are critical. But if you are looking to go on long hauls through the woods and bring a lot of supplies, then make sure the bike is durable and compatible with a trailer or rack. Whatever you choose, you want to make sure you understand what you will be using the fat bike for. This way you get the best value for the price you pay. The drive train is just another name for the gear system on your fat bike. As you might already know, the drivetrain on a fat bike can be more critical than when riding other types of bikes. That’s because with a fat bike you will cycle through a diverse array of surfaces, weather, and conditions. One day you might be ripping through the mud, the next, across a beach, and a few weeks later up a side of a mountain. You could find yourself traveling down a long paved road or speeding on a single track or exercising through a winter storm. But here’s the problem, if we get into the explanation of drivetrains, we could be here all day. If you’re already an experienced rider, then you probably know enough about them. And if you’re a beginner, you probably don’t want to over complicate the decision process. So here are the two fundamental principles when it comes to drivetrains and fat bikes. First, there are both internal and external gearing. The external gearing is the most common. Second, fat bikes are built with low gearing. This way they can tackle more technical terrain as well as get through messy rides through the snow, sand, and mud. Low gearing also makes it easier to move those big wheels. The easier you can pedal the bike, the more comfortable your ride will become. The overall weight of your fat bike is a simple concept, yet one worth a quick review. You may not think the weight would have a significant effect on your ride, and that could be true for normal bikes. But a normal bike only brings you down normal trails, through normal conditions, and in normal weather. A fat bike is far from normal, and you will take it on much more technical rides. Here’s what I can tell you: when you’re trekking up a steep incline through the mud while trying to make it to the top of your climb, the difference between a fat bike weighing 29 lbs versus one of 35 lbs will make a difference. And you will feel that difference. So, it’s easy to say that the lighter the bike, the better the ride. But remember, buying a fat bike that’s both lightweight and durable will cost you. You can always get a low-cost model, but it will be heavier. As you’ll see from the list below, the bike that costs the least amount of money is the only bike on the list made with a steel frame instead of an aluminum one. To sum it up, when it comes to choosing a fat bike…the lighter, the better. Do you consider yourself tall? Or maybe you feel as if you are on the shorter side. Whatever the case, it’s essential to check out the size ranges of the bike you are interested in purchasing. But here’s the good news: most fat bikes come in 3-4 sizes, and each size is categorized based on your height. So give the specifications a look and be sure to find a fat bike that is a comfortable fit for your riding position. Unsure if a bike will fit your body? No problem, just give the company a call or shoot them an email with any questions you may have. If anyone has the answer, it will be the company that makes the bike. The prices of the fat bikes below list from anywhere between $200 to $2000. So as you can see, there’s an extensive price range between the bikes. If you are new to fat bike riding or just if you are only looking for a bike to ride along the beach, then check out the lower priced ones. However, if you are ready to invest in your riding, and plan to take your new bike on some serious trail riding, then you will most likely want a bike on the higher end. But no matter how you ride, no one knows the best price for you besides… YOU. We all live different lives, have different budgets, and want a fat bike for different reasons. But just know there’s a fat bike for almost all budgets so pick one that’s best for you. Now that you have learned HOW to choose a fat bike, let’s actually CHOOSE one for you. Below you will find a list of the top 8 fat bikes in 2018 reviewed. Out of all the fat bikes available from Trek, the Trek Farley 5 by far comes with the most value. That’s because besides the fact that its carbon construct makes it super light and fast, you can also ride it all year round and on nearly any type of terrain. Whether the surface is snow, rocks, sand, concrete, or roots… this fat bike will roll over it all. Now there’s NO reason you can’t go for a ride. And I’m sure you would like to know just how big the tires are. Does 27.5 x 4.5 inches of the same traction as a monster truck excite you? The tires are what provides the grip and stability to ride on any surface in any weather. It also comes with an aluminum frame, A 1x Shimano drivetrain, and a Shimano Deore M6000 10-speed shifter. Now you can break into the all year round mountain bike riding without breaking the bank. Pros- Made to ride in the snow, excellent for summertime trials, you can ride all year long, excellent traction, lightweight, and fast. Cons- Introductory bike not the best design for those who are experienced. This 20 geared, midrange, super lightweight fat bike is designed for the sand and snow. It’s called the Diamondback El Oslo Dos, and its innovative fork suspension system will make those uneven surfaces feel comfortable. That’s due to its GIGANTIC tires, and as mentioned, it’s lightweight too. This bike is built with a light and durable double-butted aluminum frame. What that means for you is excellent traction off-road from its large tires but without being too heavy. It even comes in three different sizes: small (5’4″ – 5’7″), medium (5’7″ – 5’10”), and large (5’10” – 6’1″). If you’re any taller, then you are out of luck. But other bikes are built for taller riders, so don’t worry and keep reading. Since I am a parent, my most favorite part about this bike is that it’s available in a mini version. So when you bring this fun looking fat bike home, and your kids want a bike like mommy or daddy, then… they can have one too! All-in-all its an excellent bike for the whole family. Pros- Big tires work as their own suspension system, lightweight frame makes it faster and easier to maneuver, mini version available, built by a company that’s been around for a LONG time. Cons- Not great for taller riders. The Alton Mammoth 2.0 is the perfect bike for two types of riders. One: those looking for a low-cost option. And two: fitness enthusiasts looking for a winter toy to get outside and stay active when the snow hits. If you’re looking to burn a few calories in the winter and not spend too much out of pocket, then this is the best bike for you. It’s low in price, the components like the frame and drivetrain are mid-range, it’s easy to assemble, and most importantly…its durable. There’s a good chance this could be the first ever and last ever fat bike you buy. And here’s the good news: even if you want to step up to a more advanced bike in the future, because of its low cost, you shouldn’t have any problem re-selling it. It’s 26″ tires and drilled out rims will keep you moving, and it’s Promax disc brakes will provide maximum brake efficiency. If you’re are looking for a low-cost option fat bike, then you found it here. Pros- Low-cost option great for shopping on a budget, an excellent starter bike, performs well in the snow, slick green and red color design, extremely durable and tough. Cons- On the heavier side, some users have reported difficulty during assembly. This is the type of bike where users can’t believe something could cost so little but offer so much value. It’s called the Framed Minnesota 2.0, and it makes fat biking possible to do on a budget. If you are a beginner and don’t want to spend too much money, then this is the only bike you need. It’s best feature is its tight wheelbase. This makes for easy handling which is advantageous to any beginner. With its aluminum alloy frame and handlebars, it remains lightweight and durable making it one of the best beginner-friendly fat bikes on the market. Pros- Low-cost makes it a great beginner friendly fat bike, lightweight frame and handlebars make for a fast ride, excellent customer service, great value for its price. Cons- Low cost means not high-quality parts but still respectable midrange components. The Mongoose Dolomite is best explained in two words: cheap and heavy. This bike is sold at a significantly lower cost than all the other fat bikes on this list. But don’t expect the best bike on the market. The frame is made of steel which makes it heavy at has 7 speeds. But you know what? Users seem to really like it. Most say it’s an excellent entry-level fat bike. It has 26” tires, disc brakes, and it comes with strong, sturdy steel rims. Overall, what you have here is an excellent fat bike for those who are not entirely sure if they will like a fat bike and don’t want to dish out too much cash to find out. It’s also the BEST choice when shopping on a budget. Pros- Low price and available at Walmart, steel frame makes it durable, chain guard to protect its drivetrain, 7 speeds to adjust for elevation. Cons- Steel frame is heavy, thin seat makes some uncomfortable when riding, small pedals increases the chance of your foot slipping off. Here’s one for the more experienced riders. The Specialized Fatboy Base is an excellent choice for those who are ready to invest in their riding. It’s designed with a lightweight aluminum frame built for durability and efficiency shaped in a way to make for easier hill climbs. It’s ground control tires provide precise handling no matter the weather or surface, and its hydraulic disc brakes are top of the line to keep you safe and in control. This is the bike you need if performance is important to you. If you are an inexperienced rider, I wouldn’t recommend it, but if you’re ready to take your fat bike riding to the next level, consider giving it a try. Pros- Highest of quality components, super lightweight for smoother handling and speed, designed for easier hill climbs and confident descents, innovative brake systems for the safest ride possible, 4.6-inch ground control tires for quick and nimble handling. Cons- Expensive, not beginner friendly. This is without a doubt the most stylish fat bike on the list. Okay… so this Surly bike is called the Ice Cream Truck, and its bright green. So, as you can imagine, it’s a unique fat bike of its kind. With 5” tires and trail-ready stability, this is the bike you want to pull out when you have no idea what to expect on the trails. But all good things come at a cost, that’s why this bike is one of the most expensive bikes on the list. But Surly believes that it’s the little tweaks in their design that makes all the difference. For example, it has a long top tube, short seatstays, efficient head tube angle, a shortened chainstay, and a bent seat tube all for tighter handling and quick maneuvering to hit the technical trails…and hit them fast. Pros- Hip brand and stylish bike, wide tires for extra stability, small tweaks made for a superior ride, high-quality components, large tires for challenging rides. Cons- expensive compared to other bikes on the list, not sure if you want “Ice Cream Truck” written on the side of your bike. The Kona Wo has many benefits and convenient features but stands out the most is its size range. Yes, it has a lightweight aluminum frame; yes, it has large tires and excellent traction for all weather and surfaces; and yes, it’s made with high-quality parts. 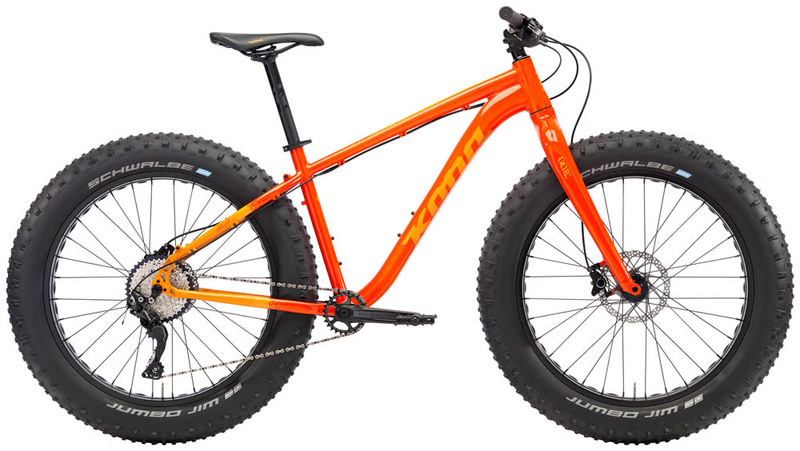 But how it differs from other fat bikes the most is its rider size range availability. This fat bike can hold riders anywhere from 4’10” to a whopping 6’5”! Not a bad height range for a mountain bike. So, whether you’re a beginner or expert, if you’re a tall rider and have trouble finding a bike for your size, then this fat bike may be your best bet. Pros- Excellent choice for tall riders, designed to fit the largest tires available, lightweight aluminum frame, hydraulic brake system for safe stopping. Cons- Price on the higher side. So now you know all you need to know about picking out a fat bike. You learned how to choose a fat bike and reviewed the top 8 fat bikes in 2018. The only thing left to do now is to pick one out. The best part of fat bikes is their accessibility. It provides you with so many more opportunities to explore nature. Bad weather? Ride a fat bike. Extreme conditions? Ride a fat bike. Technical trails? Ride a fat bike. Fat bikes allow you to get outside and ride no matter the conditions. And that might be their most admirable trait of all. That’s because no matter where you are or what you’re doing, you can jump on your fat bike, go for a ride, and become healthier in the process. No matter what fat bike you choose, the most import part is to… choose one that’s best for YOU. So, make your choice, get outside, breath in some fresh air, and enjoy every moment with your new fat bike.